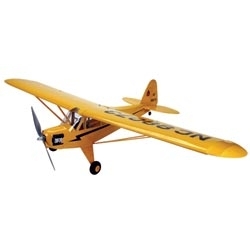 This is the only 25-size Cub with scale ailerons. Quality balsa and light plywood construction make for a sturdy, lightweight airframe that handles incredibly well in most flying situations. The firewall is set up for use with an outrunner motor, such as E-flite’s Power 25, making a perfect power match for the airframe. Optional floats add a new dimension to the scale flying experience, and the one-piece wing allows for easy transportation to and from virtually any flying field, pond or lake.